In this brief paper we'll discover that God and Christ were not the only divine beings present at the First Vision and clues left by Joseph Smith point us to a more ancient Old Testament-mode Prophetic Call or Divine Assembly where the plans and purposes of the Almighty were discussed and resolved. The First Vision (ie Visitation) may be more accurately called a Divine Council or Divine Assembly of the Godhead on earth where a young Joseph Smith played a central and integral role as testator and mortal witness of God and Christ. By considering all versions of the First Vision as well as taking cues from ancient council motifs including the calling of the prophet Lehi and other Old Testament prophets this brief paper should not distract from what we already know of the First Vision but rather expand and reveal dormant or hidden insights to bolster and amplify the calling and import of the prophet Joseph Smith. Artist's rendition of the First Vision Council and prophetic call of Joseph Smith, spring 1820. Rendition based on a Divine Council motif and 'prophetic call' narrative as per Old Testament era milieu. The earliest recitations of the First Vision come into clearer focus when one realizes Joseph is still determining exactly what elements of this most sacred event he is allowed or even willing to share with others. While Joseph certainly mentions deity the presence of other personages or "angels" indicates that potentially more is going on than is generally acknowledged. In fact, Joseph Smith never referred to what we now call the "First Vision" by that name. Instead, he referred to it as the "first visitation of angels" or the "first communication" a critical point when considering a Divine Council motif. The sequence of events appears to be that Joseph saw and spoke to God and Christ and then: "the [Lord] opened the heavens upon me". It seems after the initial introductions and instruction the vision became much more expansive and the "heavens were opened". Engraving by Virgil Solis for Ovid's Metamorphoses Book I, 162-208. Such imagery may assist in recognizing the expansive nature of the First Vision event as we begin to transition from the solitary deities of God and Christ to a more open Divine Council. This may help get us closer to understanding what Joseph meant when he said in the 1832 First Vision version that the Lord "opened the heavens upon me". "many" as defined by the 1828 Webster's dictionary: 1. Numerous; comprising a great number of individuals. "numerous" as defined by the 1828 Webster's dictionary: 1. Being many, or consisting of a great number of individuals; as a numerous army; a numerous body; a numerous people. Taking it a little further, synonyms for the phrase "great number" include: horde, legion, throng, army etc. This is admittedly an elementary exercise (but worth it for clarity) and while it's impractical to infer a specific number, it would appear based on the above definitions we're at least approaching the size of an average church congregation in attendance at the First Vision and that's on the low end. The next relevant number might be the size of a multi-stake conference. However, the definitions give us leeway to picture an even larger gathering if we're more liberal-minded with the numbers. Loggia di Psiche, ceiling fresco by Raffael and his school. Villa Farnesina, Rome, Italy. Council imagery depicted in art and mythology, Frescoe based on the myth of eros and psyche. When all accounts of the First Vision are considered it is clear that God and Christ were not alone and the view of a lone Father and Son while effective is decidedly incomplete. Rather than Joseph's description of "many angels" in the earliest recitals and then transitioning to God and Christ in later recitals and that being a modification or embellishment, we discover that in reality Joseph held back many details from public view even with the 1838 'official' version and the prophet wasn't speaking lightly when he said many things transpired and were said that he could not reveal. Early Hebrews and Christians believed that before one can see God they must penetrate the dense veil of light that surrounds him. This ancient belief, called the "Kabod" or "Glory of God" in Old Testament times stresses that God's physical form is surrounded by a brilliant robe of light and is thought to be a "visible manifestation" of the physical presence of God. It is this light as described by Joseph and the method of its conveyance that lends authenticity to the account as it is unlikely that 14 year old Joseph would be able to richly and accurately describe the unfamiliar Kabod in such detail, (God descending in magnificent glory and light) if he was not eye-witness to an actual event - a dramatic event that was certainly beyond the power of human art to counterfeit in the early 19th century either mechanically or via mental ingenuity. As the light rested upon Joseph he was then enveloped within (or allowed inside of) the Kabod and it was then and only then that he was able to see God, Christ and the full congregation of those assembled for the council - an important function or operational rubric of the Kabod that is likely to be known only via direct experience with it. The Kabod is such that outside observers would only see a brilliant light but no personages or sources of that light. Being permitted inside the Kabod would be literally entering a different realm. During the First Vision Council Joseph received guidance, counsel and instruction as to how the kingdom of God would emerge in this dispensation with his role as testator coming more into focus. As such, it is almost certain that Joseph was invited by Christ to see and feel the wounds of crucifixion, the nail prints in his hands and feet and thereby was able to fulfill his role as Testator on earth. 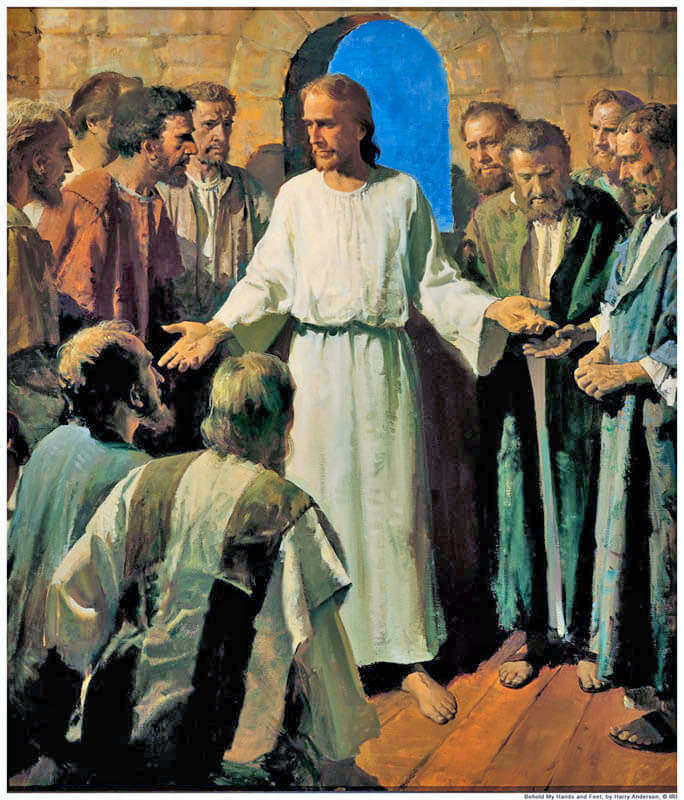 "..and thrust their hands into his side, and did feel the prints of the nails in his hands and in his feet.."
This behavior seems to be a significant part of the personality of Christ and a common manifestation of his divinity to those he comes in personal contact with as occasion permits. However, the highly personal nature and the sacredness of such an event would certainly preclude its telling to the general populace. As the pre-earth Testator it was proper, right and necessary that Joseph be part of the Divine Council. 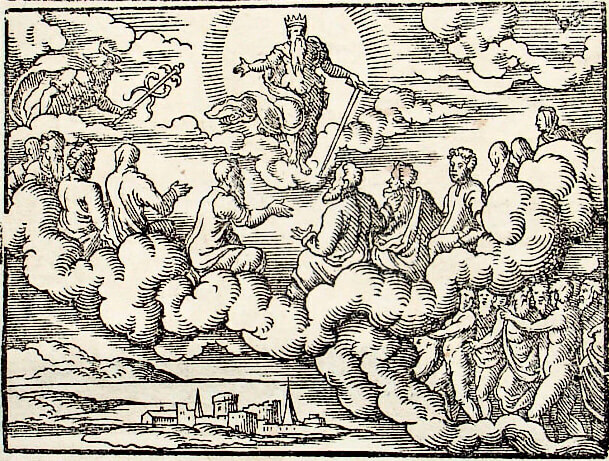 It is viewed by some that the First Vision was anticipated on both sides of the veil and therefore attended and witnessed by thousands if not hundreds of thousands in the vein of the Old Testament council visions wherein "numberless concourses of angels" are present. The First Vision should be more accurately termed the "First Visitation"
With the extant sources of the First Vision we can be sure God and Christ were not alone - that approach to the text is self-evident and indubitable. From there it's a small step to get to a council motif and prophetic call narrative based on Old Testament era dialectic. The First Vision Council heralds the glory of the calling of Joseph as a prophet in this dispensation and properly fixes our reverence and awe of this remarkable transcendental event.